IBM Workplace Collaborative Learning is an enhanced IBM Workplace product and part of the integrated collaborative environment delivered by IBM Workplace Collaboration Services. It provides learning services that help organizations manage their training programs more efficiently and integrates learning resources on the desktop. Integration with other Workplace Collaboration Services capabilities delivers blended learning experiences and provides students with enhanced tools such as course discussion areas, document sharing, Web conferencing, and chat rooms. 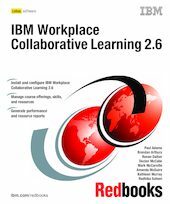 This IBM Redbooks publication serves as a comprehensive and in-depth guide to IBM Workplace Collaborative Learning, discussing how to install, configure, and effectively manage learning modules, resources and, skills within your IBM Workplace Collaborative Environment. This book provides details on how to manage skills effectively within the system, and how to leverage built-in reporting capabilities. Finally, it provides a realistic scenario to demonstrate the typical usage pattern for students using the IBM Workplace Collaboration Services version 2.6 user interface.